Based on current estimates there are between 91 and 102 million working age Americans without a job. A nation cannot sustain a service based economy with that many unemployed people that contribute nothing to the economy. A service based economy requires a certain amount of money flowing through the hands of working people to support all of the service work done. When you eliminate a large percentage of those people the system becomes unsustainable and soon collapses in on itself. This is the situation we now find ourselves in as a nation. The nation was sold on the idea of a service based economy as the new trend just as our manufacturing economy was being dismantled and moved overseas. This kept the masses quiet for a while but now the money created by workers that made real goods is drying up on main street. As the ability to make real products decreases, the ability to support service employees decreases with it. No amount of new service related jobs will fix the problem we now face because these people create no real wealth in the form of products to sell. As it has been said before, people cannot create wealth by doing each others laundry. A nation’s wealth is based on the products it has to sell. Nothing else can create prosperity but the creation of real things. The only way to stabilize the American economy or any other for that matter is to have a sufficient amount of real production in that nation. The financial sector has been the best job market to be employed in the country for some years but merely shuffling money from one person to another creates no more real goods than someone shuffling paperwork around an office all their lives. With the manufacturing sector shrinking in the country something must take its’ place in order to maintain employment in real production jobs at sustainable levels. With our manufacturing capability captured by other countries two of the only sectors left that cannot be shipped overseas are the mining industry and the agricultural industry. These industries create real goods that can be sold here and abroad. It is these industries that will inevitably help us to stabilize our job market. The mining industry requires a great deal of investment in most areas to operate As a result this enterprise is not something individuals are able to do in mass. The number of large machines and people needed to pursue this type of production is beyond the ability of most job seekers with little in the way of funding. That leaves this industry to those companies with the knowledge and funding to make it possible. Even then, the hostile attitude toward mining our resources by the current government makes this a difficult proposition at this time. This is evident by the war on coal now embraced by certain individuals. The agricultural industry is a different matter in many regards. It is within the ability of many individuals to create and operate a working farm from scratch. On a farm you can literally grow a product from seemingly nothing. Whether it is a field of corn or a herd of beef cattle, it is something individuals can do to create a real product to sell. Because farming is a vocation that can be done by individuals or families, it provides the opportunity for those in need of employment to create their own job from thin air so to speak. A farmer does not get an automatic paycheck every week like his city cousin. Anything the farmer gets must be earned by real work. Real work producing real goods is the only cure for a nation slowly falling into an abyss of unemployment. In the early 20th century about 30% of the nation still worked and lived on farms. This meant that the other 70% were employed in the other job sectors. Many of these jobs were in manufacturing and mining. The service industry was small and manageable at this time. There was sufficient real production in America to carry this small number of service employees. In the current situation we now find ourselves in, we must rethink the dynamics of the past and incorporate that into our future. Only about 2% of the current population lives and works on farms today. The bulk of our production is carried out by large corporate farms and by the use of modern equipment costing in the many thousands of dollars that is used by most private farms to operate the large acreage they have. In the last several decades the small family farm has been displaced by corporate monoculture farming. The small farm with its small size and equipment needs was well suited to families that could produce goods and make a reasonable living. It is this small family size farm that will be necessary to the rebuilding of the nation and to end the large numbers of jobless Americans. The expansion of small farms will be at the cost of the large corporate farms but that is a necessity for longterm viability and job creation. In order for the nation to stabilize the employment in this nation, the farming sector must be repopulated by small farms providing homes, jobs and a real product that can be sold. The farm population needs to be expanded from the current 2% into the 20% range. This will relieve the joblessness and help to take the pressure off of the mining and manufacturing sectors longterm. Having this much of the population that is self employed and self sufficient in housing and food will reduce the strain on the need for public assistance as well. The additional benefit of this many farms in America also provides a cushion in the event of a national disaster that cuts off transportation ability. The ability of small scattered farms to produce food and distribute it to local communities is a strategic asset in times of emergency that cannot be replicated any other way. 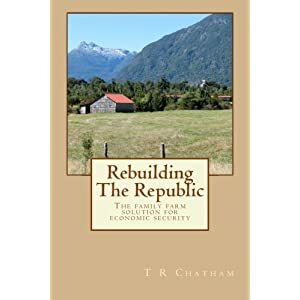 By rethinking the way we live and work we can repair some of the damage already done to the nation but we can by no means return to the level of production and prosperity we once had. Those days are gone and we must now focus on the basics of survival as a nation. The future will require a drastic lowering of our living standards but that does not mean we must lose our quality of life as a society. We must return to the simple pleasures we once knew as a nation and a people.